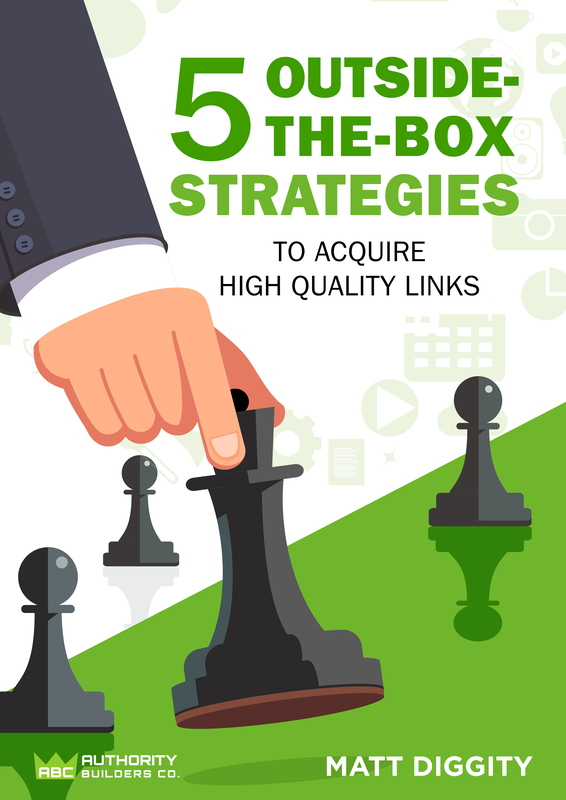 Most SEOs have their own approach to outreach or whitehat link building; however, most SEOs will also agree that the goal of outreach is to acquire link placements (from real blogs and websites with authority and traffic) that will move the needle, as cost-effectively as possible. As with everything in SEO it’s about your ROI. 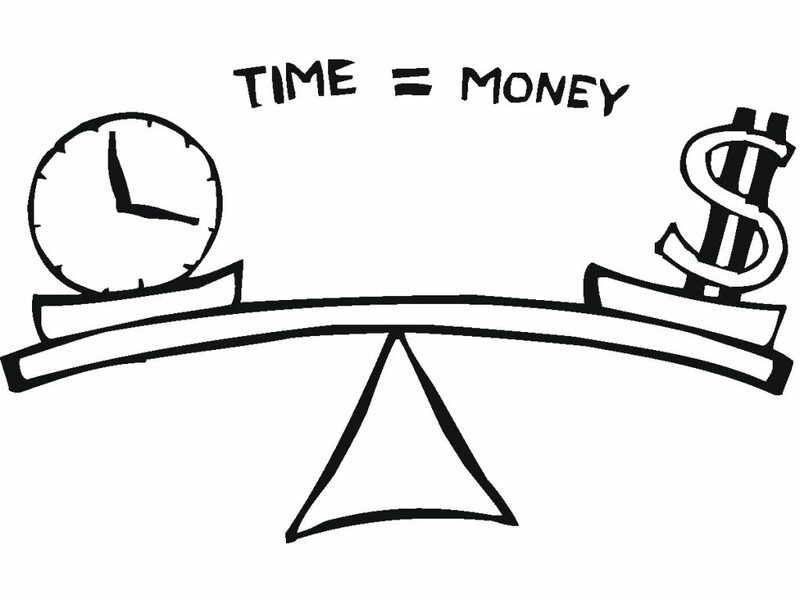 And not just the direct cost, for SEOs time is money. Because we’ve made outreach our business we are always exploring different strategies that will help to reduce costs and maximize ROI and in this article, we want to share some of those strategies. 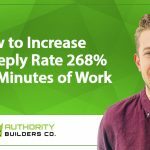 You’re going to learn a quick way to increase your response rate on outreach emails by 268% with hardly any effort. 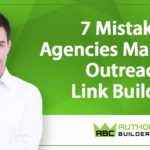 I want to share with you some small changes you can make to the way you set up your outreach that will help to get blog owners to listen to your proposals, and ultimately, to increase your ability to place links. At the same time, we’re going to run tests to provide data that either supports the theory or dismisses it. Most importantly, the changes are easy to make and require little to no investment. Blog owners love their blogs. It’s an understatement to suggest they’re protective over them. Some because they’re business people, they see it as protecting their investment. Others because they started the blog as a passion project and watched it grow into something special. Bottom line, they’re very selective, it’s not easy to get them to agree to a guest post and these days, they are flooded with proposals which makes it even more difficult. With that in mind, consider how many of those emails they get day-after-day are canned templates, that look spammy. 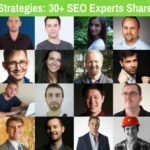 They give other SEOs a bad name and make our lives much more difficult. A lot of prospectors use a template that they send out to hundreds if not thousands of mined emails addresses. It’s about bulk, the more, the better. The problem is, it’s often the same template used, it’s very clearly a template, it’s also very impersonal. If it looks like spam, walks like spam… it’s probably spam, right? We all get contacted by African princes and the World bank on a near-daily basis. We instinctively know what spam looks like and we are very quick to distrust unsolicited email. Rightfully so. With outreach, we have to do everything possible (without taking up too much time) to ensure that our prospecting stands out from the crowd, but not only stand out we make sure it doesn’t come across as spammy because we’ll immediately hit a brick wall. There are a variety ways to do this, and two simple tweaks to your outreach I’d like to explore, (which experience tells me really makes a difference) are to use a branded email address AND to use a well-designed signature block. I think that they are effective in increasing positive replies to outreach because they help to demonstrate that you are contacting the prospect from a position of authority and trust and these “strategies” help to the receiver that impression. So many prospectors do their cold outreach with a Gmail account. It’s easy to understand why. They are cheap, quick to set up and if you send out less than a couple of hundred emails a day, they’ll very likely to hit the inbox. However, business or official organizations rarely do. Most of the spam or unsolicited emails I receive is from generic email addresses, so unless I recognize the sender I am very unlikely to open it. However, if I receive a branded email that I am not expecting I’m assuming that I’ve given up my email for a reason or they have a reason to contact me. I’m much more likely to consider opening it. With that in mind, when running outreach, if you are able to get a client email address for outreach, it’s definitely worthwhile because the client is likely to be niche relevant and hopefully considered an authority. If it’s not possible, using your agency’s brand or creating a brand for your affiliate site works too. That’s the theory, and I’m going to run some tests to see if the data validates this theory. In a nutshell, it seems logical that using a professional signature block will instantly let the reader of the email know you’re serious and it should add trust and validity to your offer. Readers not expecting an email will make a judgment in just a few seconds whether they are going to take the time to read it. So you need to grab their attention and the theory is a signature block helps with that. The good news is, it takes minutes to set up. If you not able to create one yourself, there are loads of tutorials on YouTube or you can get a signature block made on Fiverr, for next to nothing. If you can, it would make sense to use a signature block from the client when talking about client SEO. Often the client has a brand identity that immediately acts as a trust signal for blogs within that niche. 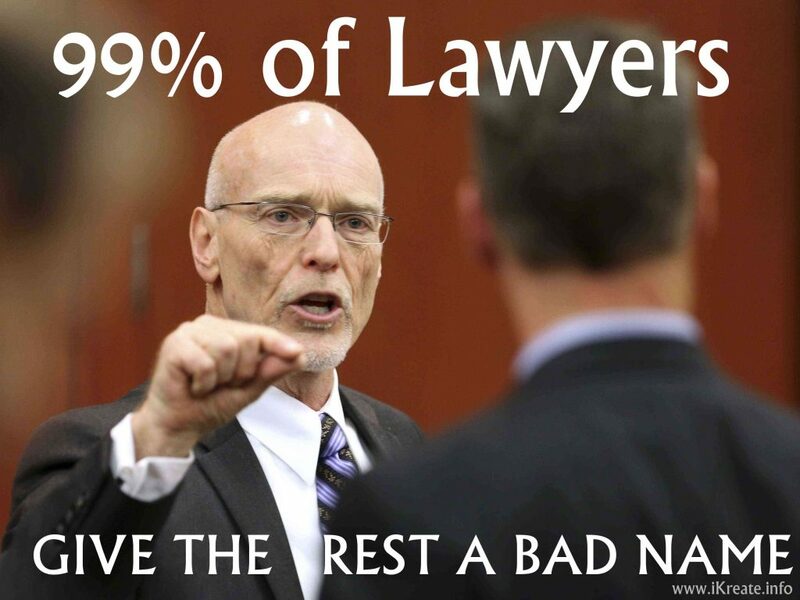 I have a client who are professional liars lawyers specializing in the construction industry. Naturally, they’re looking for links from authority or niche relevant sites related to the construction industry. Sending out prospecting emails from an email address that has lawyers in the address and that has a signature block with logo and contact details really add authority to my email before they’ve even read it. The first and most important goal is to get your recipients to open your email and read it, the first paragraph at least. You could have the best offer in the world of outreach but if very few recipients give you the time of day, it won’t matter. The email address can help to build trust. A signature block builds trust, and so if I have something of value for them, I am more likely to be listened to and more likely to persuade them to give me a placement. And equally, as importantly, they help to differentiate my email from the rubbish, spammy emails the prospect receives from other prospectors. It passes the sniff test (it’s logical) but at ABC we don’t leave it at that, we love to test everything. So, we’ve run a little test to collect data on just how effective implementing branded email addresses and signature blocks can be. The test subject is a client. A men’s fashion E-commerce website. I sent 600 emails to fashion blogs in total. An unbranded, Gmail address, used in this niche, had an 8% success rate (16 positive replies from 200). Which, from experience, is pretty standard. Depending on the niche and how you have sourced your prospects, you can expect 5-10% positive reply rate and 8% falls in line with that. 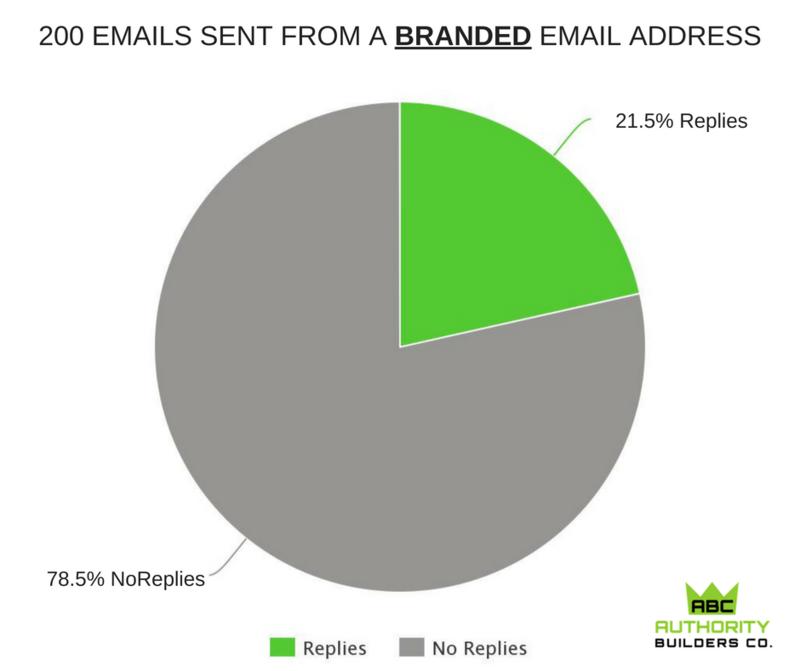 The 200 emails sent out from a branded email address (In this case, the client’s branded email address) showed a significant increase in positive replies with 21.5% positive replies (43 positive replies out of 200). Having used the same semi-personalized email template on both groups, and with similar delivery rate, this is would be data that confirms having a branded email address increases the number of positive replies we can expect and significantly so. It’s a significant difference. Scale that over the days and months and you will see a major difference in your ROI. Now we need to measure the effect having a signature block has on a reply rate. Looking to compare positive replies from an email sent out to 200 prospects with just a branded email address, in comparison to replies from an email sent out to 200 prospects using both branded email address AND a signature block, we can see an increase of 8%. The signature block group had a total of 59 positive replies, which is just under 30% (29.5). That’s x3 more positive replies than a prospecting email sent out from a generic emails address and without a signature block. We tested 2 small changes to the way we prospect potential link placements. These changes, from experience and common sense, tells us they increase the effectiveness of our outreach. 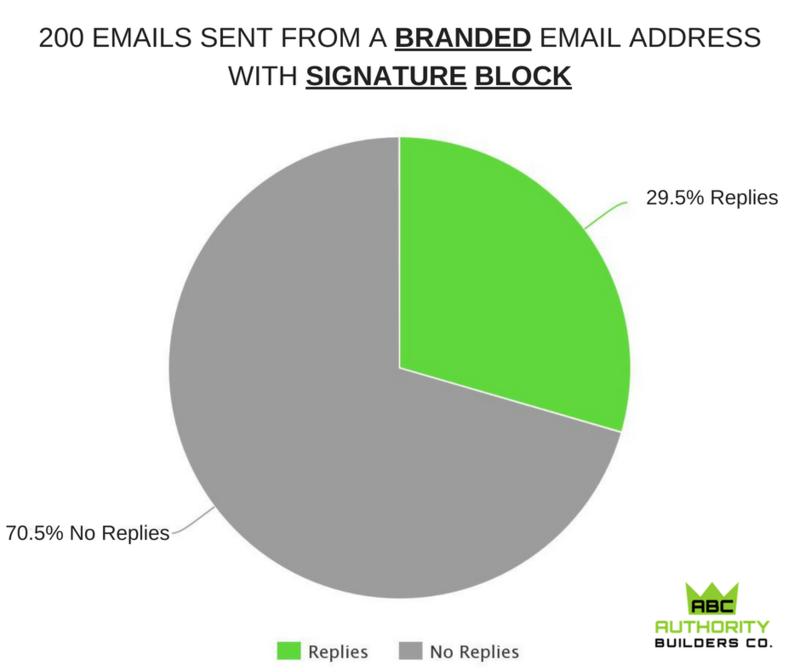 Specifically, we wanted to explore what effect, if any, having a branded email address has on outreach and also, how a professional signature block affects the number of positive results we receive. Both tests provided us with data that reinforces these changes. 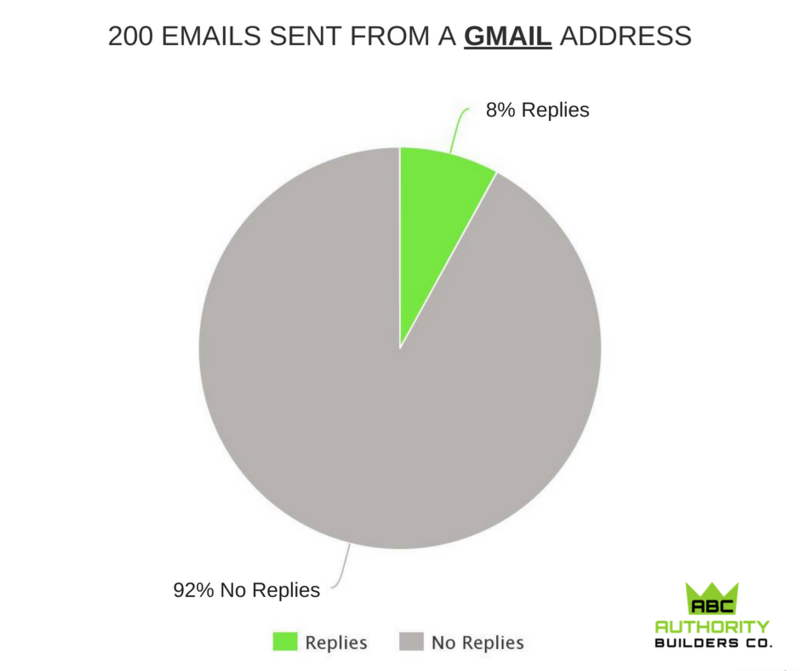 Yes, using a branded email address ( in the test a client email address) has a really positive effect on the number of positive replies you can expect to get from prospecting. In the test case, it more than doubled. From 8% to 21.5%. Every niche will deliver different results, as will the quality of your email copy and the value of your offer, but the results suggest it has to be worth exploring. The second test included incorporating a signature block. Because it was a client-branded email address, we used a client signature block. Again the results proved that using a signature block positively impacts the number of positive replies we get when prospecting. Specifically from 21% to 29%. The difference between 8% to 29% really drives home the point. These changes really make a difference to outreach performance. As with everything else we do in SEO, trust matters. The data suggests being able to differentiate your email from others, by have easily identifiable trust signals like a signature block and branded email address, increases the effectiveness of your outreach. These are both strategies you should look to implement and test for yourself. Adding an email signature didn’t change your delivery rates? Everyone says that adding images and html like a signature would lower your delivery rate and land you in spam. Not in our experience. I recently ran some deliverability tests which showed embedded (not attached) images increased deliverability. I was actually got my emails flagged as spam by SpamAssassin just because the signature. Was using simple one from free online generator, and when tested without the signature the SpamAssassin alert vanished. Interesting. Thanks for the share. If I can ask which business email service do you use ? gsuite or microsoft 360 ? Should help to to choose and make sure the smooth delivery . I use Rackspace for emails – we just use their standard mailbox package which is roughly $5 per mailbox. Highly recommend!